This may not be entirely new to readers of the old World Wide Web, I think I posted an early draft of this paper. Indeed, it has been six months in revsion. And now I have missed the deadline for publication. The paper was originally intended as part of an special edition of a soemwhat posha cademic journal. I thought they might protest at the content ideas. But no, the big problem was the referencing. One reviewer said: “I did, however, miss proper referencing in the first few parts of the paper. For example, the author is unlikely to have come up with the link between the societal demands of the industrial revolution and the organisational structure of the education system, but it looks as if that is what he claims.” Well I did. Honestly. But I am sure I am not the only one to have that idea and if anyone can come up with refercnces for me I would be very grateful. And also for any other feedback. I have included the full text of ther paper in the extension to this post. But I have also linked it as an RTF file if you would prefer to download it. This paper examines the social impact of Personal Learning Environments. In so doing, it is difficult to separate cause and effect. Personal Learning Environments can be expected to have a profound effect on systems for teaching and learning, on pedagogic approaches to learning and on knowledge development and sharing. Conversely, the emergence of PLEs and the widespread interest in PLEs may be seen as a reaction to the changing ways in which people are using technology for learning, to new societal demands for education and to changing forms of knowledge usage within society. Education systems and institutions develop to meet the needs of society at particular stages of economic and social development. Education systems serve not only to develop the skills and knowledge in the workforce required by industry but also to develop social capital. Furthermore, the organisational forms that education systems develop reflect particular organisational forms of capitalist production. The present ‘industrial’ model of schooling evolved to meet the needs and form of a particular phase of capitalist industrial development. The first industrial revolution imposed new requirements in terms of skills and knowledge – in particular the need to extend general education to wider layers of society. In the second half of the 19th Century, in the UK, there were a series of education Acts designed both to extend participation in education and to regulate the education system. Whilst before 1870, education was largely a private affair, with wealthy parents sending their children to fee-paying schools, and others using whatever local teaching was made available, the Forster Elementary Education Act 1870 required partially state funded board schools to be set up to provide primary (elementary) education in areas where existing provision was inadequate. Board schools were managed by elected school boards. The schools remained fee-paying. (New cite author Wikipedia). Under the Elementary Education Act 1880, education became compulsory from the ages of 5 to 10. It was not until 1893 that the Elementary Education (School Attendance) Act raised the school leaving age to 11 and 1902 that the state took over education, through the organisation of Local Education Authorities and the provision of funding for schools from taxation. These reforms were based on a perception that for Britain to remain competitive in the world by being at the forefront of manufacture, higher levels of participation in education were necessary.1It is notable that there was opposition to these reforms based on the one hand on the idea that this would make the labouring classes ‘think’ and could lead to revolt and on the other that handing children to a central authority could lead to indoctrination. The form of organisation of schooling and the predominant pedagogy were based on the forms of production developed through the industrial revolution. Schools resembled large-scale factories for knowledge, organised into different departments with a foreman or woman in control of each class and an overall manager in charge of the school (in older industrial cities in the UK it is sometimes hard to distinguish between old schools and factories). Classroom monitors (or prefects) acted as overseers. Students sat at desks organised in rows. Work was to take place with set starting and finishing times each day. Bells would announce the start and end of rest periods (or breaks). The system evolved to provide a basic technical education for the majority (through Secondary Modern Schools) and a more advanced academic education in grammar schools for a minority progressing to university. The selection of schooling routes was reinforced the class divide. There were continuing changes and reforms in the education system throughout the 20th century. In the UK, perhaps the most notable were the move to end the 11 plus entrance examination for grammar schools and the establishment of comprehensive schooling and the move towards mass university education heralded in then Prime Minister James Callaghan’s 1976 ‘Ruskin speech’ which argued for society’s right to have a say in what was taught in schools – through establishing a “core curriculum of basic knowledge”.2 However, which sections of society were to have their say was more contentious. The crisis in industry in the late 1970s led to a merger of the Education and Employment Ministries, the establishment of the Manpower Services Commission and an increasing emphasis on skills for employment. Such reforms basically reflected the changing needs of industry and the economy at the time. However, despite the reforms, the main forms of organisation and delivery of education, the institutional form of schooling, the development of curriculum and approaches to pedagogy were based on the Taylorist organisation of production stemming from the industrial revolution. Industrial revolutions lead to profound and often paradigmatic social change. However, such paradigm changes in the social arena tend to lag behind at times of rapid technical development and change. The present deep and prolonged industrial revolution, based on the development and implementation of digital technologies, is leading to massive pressures on education and training systems, both in terms of the changing demands from society – especially from employers – for new skills and knowledge (seen in the move towards lifelong learning) but also from the changing ways in which individuals (especially young people) are using Web 2.0 technology to create and share knowledge (Attwell, forthcoming). The combination of these pressures is likely to result in a longer-term paradigm shift in our education systems – including the organisation and form of educational institutions and infrastructure (e.g. funding) and curricula and the pedagogic approaches to learning and knowledge development. Of course the new technologies have already impacted on education with various phases of innovation, culminating in the present wide scale adoption of Learning Management Systems and Virtual Learning Environments. It is another feature of industrial revolutions that profound innovations in technology tend to be reflected in older paradigms. Rather than focusing on the possibilities of the new technologies for fundamental innovation, we tend to replicate previous forms of organisation and communication through the new technology. In education we have attempted to adapt the technology to the existing paradigm of schooling with the resulting virtual classroom and virtual college. Where do Personal Learning environments fit in? Personal Learning Environments represent perhaps the first attempt to develop educational technologies which transcend the traditional paradigm of industrial schooling and move beyond the forms of organisation of that paradigm. PLEs represent an attempt to use technology to move from school (institutional or course) led learning to learner led learning. As such, the first major visible impact may be in the institutional organisation of education which forms the subject of the next section of this paper. In the last section I outlined two key challenges to education and training systems: the need to facilitate and support life long learning and the changing cultural and pedagogic ways in which young people are using technology for learning. How are education systems reacting to the challenge? Primary education, in most countries, fulfils the role of providing basic skills in reading and writing – and, increasingly, digital literacy – and in providing a social environment for children to interact. Pedagogic approaches include story telling, group work, play and project based learning. Whilst universities provide access to higher education for an increasing age cohort, it could be argued that they have failed in terms of providing access to in terms of lifelong learning. However it is at the level of post primary – or secondary education that the systems seem to be particularly challenged. It is notable that at least in Europe almost every system is in the process of reforming post 10 or post 11-year-old education systems and provision. Despite the reforms, in many countries there remains concerns that the systems are not working3. (OFSTED quote) Even with relatively high investment in education, the proportion on non achievers remains persistently high, teachers are often disillusioned, employers complain about the low levels of skills and competence from school graduates and many young people, when questioned, are less than enthusiastic about school. At best, it is just a hurdle which has to be jumped in order to progress in their lives. (Social mobility quote – class based)In the following section I will look at why post-primary education systems and institutions may be seen as dysfunctional within today’s culture and society. I want to draw attention to three particular aspects of what I believe to be dysfunctional aspects of secondary education schooling systems: the development and use of educational technology, the culture of networking, sharing and collaboration, and curriculum design and development. Young people are increasingly using technology for creating and sharing multi media objects and for social networking. A Pew Research study (Lenhart and Madden, 2005) found that 56 per cent of young people in America were using computers for ‘creative activities, writing and posting of the internet, mixing and constructing multimedia and developing their own content. Twelve to 17-year-olds look to web tools to share what they think and do online. One in five who use the net said they used other people’s images, audio or text to help make their own creations. According to Raine (BBC, 2005), “These teens were born into a digital world where they expect to be able to create, consume, remix, and share material with each other and lots of strangers.”. However, the major implementations of educational technology have been not to encourage such networking and creativity but to manage learning and to isolate networks. Learning Management Systems are WSYWYG – they do what they say, manage learning. Systems have been developed as a ‘walled garden’, to perpetuate the isolation of the school from the wider outside community. We tend to recreate with new technologies older forms of social organisation. Thus, we talk about virtual classroom or the virtual university, attempting to recreate and preserve the old paradigm of education with new technical forms. Even in Second Life, a multi player 3D virtual world, universities have been investing heavily in buying islands to recreate in 3D form their buildings and classrooms. In addition, most education systems have acted with, at best, suspicion and often downright hostility to social networking systems and technologies. In the USA a bill is proceeding through Congress to ban access to social networking sites from public institutions. In Europe we insist that young people turn off their mobile phones to prevent them texting friends in school. Yet these are the very systems and tools that businesses are increasingly seeing as central to future knowledge creation and distribution! Yet the schooling model remains rigidly tied to the idea of developing and assessing individual attainment. Of course, the idea that we should enable each individual to develop to their full potential is laudable as a social goal but if knowledge and creativity is dependent on engagement within wider social networks then how can this be developed within education systems based on individual attainment? (I will talk more about the issue of assessment later in this paper). The third illustration of how education and schooling systems are dysfunctional relates to curriculum. Most learning does not take place in formal educational programmes. Cross (2006) argues that only 10 -15 per cent of learning is formal, that 85 per cent of our learning takes place outside of formal settings. Learning is taking place through engagement in social networks – both by young people of school age and by older people in work. Furthermore, learning takes place in multiple contexts, in work, in the community and in the home as well as in school. Yet our schooling systems remain wedded to attainment against a narrow curriculum of formal knowledge. Informal learning is hardly acknowledged, less still fostered and facilitated. We face the danger that school may become irrelevant for the every day lives (and learning) of many young people. How can we overcome such dysfunction? Fraser (2007) has looked at how Web2 tools and applications are currently being used to supplement the limitations of Learning Management Systems (or Virtual Learning Environments). In common with many educational technology researchers, she is interested in the concept of the Personal Learning Environment. Fraser says the PLE has become a tool for empowerment as it embodies the principles of self-directed learning. It recognises that learners exist in an ecosystem and that the PLE is a tool for learning within that ecosystem. The PLE is the system (or multiple systems) that enables and supports the growth and behaviour of self-directed or self-motivated learners. Fraser sees such a development as a move from Adaptive Personalisation to Dynamic Personalisation. The following table shows the processes involved in such a shift. Critical to such an understanding is a basic paradigm shift from learners engaging with institutional provision and procedures to the institution engaging with the learner. This would imply that institutions have to recognise the new cultures of learning and networking and engage with those cultures. Yet that involves profound change in institutional practice and procedures and institutional organisation and in curriculum organisation and pedagogic approach. Instead of the present schools we could envisage the idea of Community Learning Centres. These would be support centres open to all ages – at least from the age of 11 or 12 upwards – although there is a case for maintaining separate primary learning provision. Critically such centres would be networked allowing access support for learning currently only available in specialist schools or in Higher Education Institutions, within the community. Learners could work on projects combining elements from different subjects. Individual learning plans would be developed through a Personal Learning Environment with the support of ‘teachers’. Such projects would be undertaken in teams with ‘teachers’ facilitating learning. Teams could be geographically based but might well include participants from other Community Learning Centres and from other countries participating through networked communication. Although this might seem far-fetched, many young people participate in on-line communities involving participants form different countries in their leisure time. Projects could also include the wider community including community based organisations and enterprises. Such a pedagogic approach is not new but the use of new technologies can greatly enhance the learning potential. Learners would be able to access federated (or central) repositories of Open Educational Resources. New resources, created by ‘teachers’ and learners to meet the particular need of a learning task would be added to such a repository. Community Learning Centres would support wider community resources including provision for adult learners and support for single parents. Members of the community would be encouraged to assist with the learning provision. The local community, with regular and open meetings to discuss management and future development, would control centres. Buildings would be designed to facilitate interaction between small groups of learners, providing privacy and quiet for intense activities but also encouraging transparency and communication. It goes without saying that they would also provide access to bandwidth and to Information and Communication Technologies. These ideas are not new. Thinking and practice already exists, although all too often innovative practice has not been mainstreamed. ICT adds an extra dimension and creates additional possibilities and may enable the new pedagogies to speed up the rate of change. Higher Education providers would be given a new role in supporting networked Community Learning Centres. But with more learning occurring at local level, and learners participating in the network of centres as a whole, not an individual institution, they would also be able to focus on research (with that research shared under Creative Commons and Science Commons licences). Hopefully, over a period of time the motivation for participation in ‘school’ would become a self drive interest in learning activities. However, it may be that we have advanced the leaving age for full time education too far and young people, from say 14 or 15, should be offered the opportunity to undertake paid work whilst learning. At present, assessment is usually based on individual achievement. This is a substantial barrier to collaboration, reflection and feedback and to project based group work. Rick Stiggins (2004), building on the work of Black and William (1998) distinguishes between the assessment of learning and assessment for learning. The assessment of learning seeks to discover how much students have learned at particular point in time. Assessment for learning asks how assessment can be used to help students learn more, better and differently. Assessment for learning can promote new pedagogic approaches including peer group learning and reflective self assessment. Personal Learning Environments can play a central role in assessment for learning in allowing learners to record and reflect on progress and attainment both as an individual and as part of groups. Learners would be encouraged to produce regular presentations of their work, which would be shared on line and also provide a resource both for other learners and for the broader community. The recent focus on life long learning, in the last thirty years, has been guided by a narrow discourse. Driven by a shorter product life-cycle, the increasing speed of adoption and implementation of new technologies in the workplace and the increasing instability of employment with the computer driven industrial revolution, it was reasoned that workers would need continuous learning throughout their work-life to update their occupational skills and knowledge or to learn new occupational competences. It was contestable as to who would be responsible for this. Whilst previously continuing vocational training had been the responsibility of employers, with the state playing a leading role in the provision of continuing education and training, it is now increasingly argued that individuals are responsible for maintaining their own employability, albeit sometimes with the assistance of grants, vouchers and subsidised courses, If not continuous, learning is now seen as multi episodic, with individuals spending occasional periods of formal education and training throughout their working life. The idea of lifelong learning was originally rooted in the workers’ movements. In the UK, the Mechanics Institutes, the Miners Institutes and organisations like the Workers Educational Association organised classes and courses for workers to improve their own education as well as providing access to learning resources and social activities. Whilst this provision might have aimed at developing technical and labour market related skills and knowledge, it was guided by a wider belief in the power of education for emancipation. The idea of a Personal Learning Environment recognises that learning is discontinuous and seeks to provide tools to support that learning diachronically. It also reinforces the role of the individual in organising their own learning, including learning based on personal interest and with a less narrow employment based focus than has been so in much face to face provision. Moreover, it is now recognised that learning will take place in different contexts and situations and will not be provided by a single learning provider. Linked to this is an increasing recognition of the importance of informal learning. Personal Learning Environments can bring together learning from multiple contexts, including from home, form school and from work and can support formal learning activities provided by different educational institutions. Whilst there have been a number of studies in the different ways in which young people are using computers for social activities and for learning, only limited attention has been paid to the way computers are being used for learning in the workplace. A seven country study of the use of ICT for learning in Small and Medium Enterprises found that computers are already being widely used for informal learning through searching and networking (Attwell (ed), 2007). The survey showed that there was little use of ICT for formal learning in the SMEs (in fact there was little formal learning taking place at all). However, in contrast to the paucity of formal learning provision in the SMEs studied, there was a great deal of informal learning taking place. From the study most informal learning appeared be learner driven, rather than planned in conjunction with others in the enterprise and was typically a response to a problem. Nevertheless, some learners were motivated by their own interest rather than by a particular problem. The main means of ICT based learning was the use of Google key word searches. Managers were often unaware of this learning, although they were frequently aware of the problem which inspired it. There were considerable differences in the use of ICT for informal learning between different enterprises. It would be tempting to ascribe these differences to age, sector, size or occupation but it is hard to discern such causal factors from the case studies undertaken. None of the employees in the enterprises studied had attempted to claim recognition or accreditation for the skills and knowledge gained through informal learning. It is not clear if this is because they are not interested in pursuing further formal qualifications or if it is because they are unaware of any opportunities of claiming accreditation for informal learning. The use of the Google search engine as the major tool for learning is interesting. It raises the question of how people are framing their search terms, how they are refining search strings, how they are selecting from the results of search queries and how they are following hyperlinked texts. For a search result to be useful it needs to produce materials, ideas and concepts which can connect with the learner’s existing knowledge base on the one hand and deal with the issue or problem being addressed on the other. The ideas of legitimate peripheral participation and proximinal development may be helpful for explaining this process and of understanding how people are making sense of knowledge. Lave and Wenger (1991) propose that the initial participation in a culture of practice can be observation from the periphery or legitimate peripheral participation. As learning and observation in the culture increases, the participant moves from the role of observer to a fully functioning member. The progressive movement towards full participation enables the learner to piece together the culture of the group and establish their identity. “Knowing is inherent in the growth and transformation of identities and it is located in relations among practitioners, their practice, the artefacts of that practice, and the social organization…of communities of practice.”(Lave and Wenger, 1991, p 122). Especially in micro enterprises, SME employees have tended to be isolated from communities of practice. This may be a greater barrier to learning than the lack of time to attend training courses. One of the most powerful uses of ICT for learning in SMEs could be the ability to connect to distributed communities of practice. Many people have commented on the phenomenon of ‘lurkers’ on discussion sites, lists servers and bulletin board. Lurking is very much a process of legitimate peripheral participation. Watching, listening and trying to make sense of a series of posts and discussions without being forced to reveal oneself or to actively participate allows the development of knowledge ‘about knowledge’ within a community and about the practices of the on-line community. However, the expert scaffolds the environment to the extent in which the learner is engaged with the discourse and participants within the zone and is drawn from a peripheral status to a more engaged status. The peripheral learner interacts with the mentor, expert learners and peers within this zone. More able learners (peers) or the mentor will work with the less able learner potentially allowing for socially constructed knowledge. Within the SME studies there were few instances of mentoring or continuous contact with an expert. The use of ICT was allowing distributed access to expertise – albeit mediated through bulletin boards, forums and web pages. This leaves open the question as to the process of scaffolding which essentially becomes an internalised process. However, the process of less able learners working with more able peers is a common process in seeking new knowledge through the use of ICT. Essentially workers are using search engines to seek out potential forums and contexts for learning. Selection depends on the degree to which there is a match of interest between learner and community and also the level of discourse in the community. There is little point in following a discourse at too low a level, of knowledge already gained, neither is their an attraction to a discourse clearly on a level which cannot be understood. Learners will seek a community with knowledge at a higher level than their own but which can connect with their prior learning, learning and practice. They will lurk in order to understand the workings of the community and to gain some basic knowledge. After a period of time they might contribute in the form of a question and later again might themselves contribute to the shared knowledge pool. In this ways they move from the periphery through lurking to full bound participants in a community. It should be noted that communities are frequently overlapping and that the use of hyper-links and more recently standards like track-back allow the communities to be dynamic with the emergence of new groups and discourses. The results of this study demonstrate the potential for Personal Learning Environments as a tool for Lifelong Learning, linked to communities of practice. Personal Learning Environments can extend access to educational technology to everyone wanting to organise their own learning. PLEs can include and bring together all learning, including informal learning, workplace learning, learning from the home, learning driven by problem solving and learning motivated by personal interest as well as learning through engagement in formal educational programmes. This final section of the paper examines the impact of PLEs on knowledge sharing and development. I argued in a previous section, that the schooling model developed out of the first industrial revolution had isolated learning – or education – from wider communities. Furthermore the curriculum has been based on formal bodies of explicit knowledge or on technical rationality – the idea that it is possible to learn everything that needs to be known about a subject. Learning has been separated from processes of innovation and knowledge creation. Even in software applications, learning platforms have developed independently of systems for knowledge management (although often these are merely information databases). Yet knowledge development has been identified as a key factor in innovations designed to increase the supply of creative knowledge value: “what is important for the production of knowledge value is not so much facilities or equipment in the material sense, but the knowledge, experience, and sensitivity to be found among those engaged in its creation” (Sakaiya, 1991, p270). This way, knowledge is assumed as the real driving force of our era but also strictly linked with day-to-day problem-solving and problem-setting in working situations and, more generally, with the development and use of professional competencies and expertise. Learners gain knowledge through a process of personal and co-operative experimentation, questioning and problem solving through which meaning can be constructed. Learning is the articulation of schema which incorporate cognition, perception and action (Mjelde, 1994). Schema are made meaningful by jointly carrying out activities with an ‘expert’ in such a way that the learner gradually masters successively more difficult parts of the task through successively more complex stages (ibid.).. As early as 1994, Enkenburg proposed that the authenticity and transfer of knowledge and skills depends on the refinement of intelligent instructional systems and on the design of learning environments in which students are helped to construct knowledge themselves (Enkenberg, 1994). Teaching and learning strategies include modelling, coaching, scaffolding and fading, articulation, reflection and exploration. Within a social model of knowledge creation, the pre-requisite process for genuine knowledge transformation to occur is that knowledge has to move from the individual level into wider communities of interaction that cross organisational boundaries (Attwell and Brown, 2000). Personal Learning Environments can bring together individual learning and collaborative and organisational knowledge development. 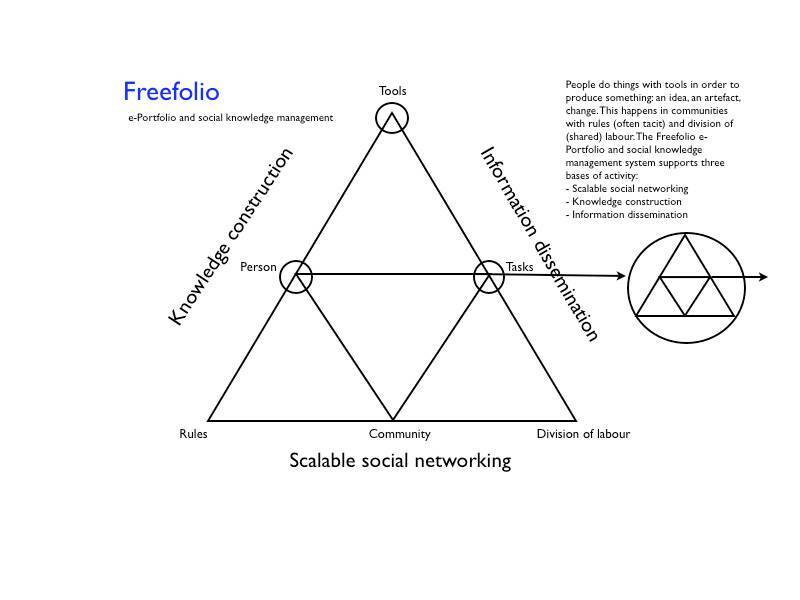 The following activity diagram, developed for the Freefolio ePortfolio and social knowledge management system, shows the relationship between learning and knowledge construction. Freefolio, despite being described as an e-portfolio and lightweight knowledge management system, is essentially a Personal Learning Environment. The tools mediate knowledge construction by individuals within communities of practice. Such communities establish rules, although these rule are often tacit, and of course reflect a division of labour which in turn mediates the practices of that community. Through the process of social practice, described as tasks such knowledge is disseminated into wider environments. Although most attention to Personal Learning Environments has been in the context of education, it may be at the level of knowledge construction and innovation that their impact will be most profound. Knowledge management systems have been developed largely in isolation from learning systems. PLEs can unite processes of learning and social and organisational knowledge development. Personal Learning Environments are a significant move forwards for three reasons. Often the introduction of new technology in education has tended to inhibit pedagogic innovation and change. Virtual Learning Systems have focused on managing learning. The IMS Question & Test Interoperability (QTI) specification for assessment has inhibited the introduction of peer assessment and focused assessment on what people know, rather than on assessment for learning. In contrast Personal Learning Environments they can stimulate the development of new forms of pedagogy and facilitate the introduction of social forms of learning e.g. use of social networking. PLEs, by themselves, do not represent a new practice in teaching and learning. But PLEs can enhance existing best practices and speed up the rate of change. Thirdly PLEs bring into sharper focus issues around the shift from teaching to learning and may provide some solutions to some of the problems in this area. However, by themselves, PLEs cannot transform our education systems and practice. They are but one tool in changing the social practice of education. Brown, A. (1997), “Valuing the development of practice, expertise and research int continuing professional development of vocational education and training professionals”, paper presented at European Conference on Educational Research (ECER 97) Frankfurt, September 1997. Mjelde, L (1994) Will the Twain Meet? The World of Work and the World of Schooling (Vocational and General) in Relation to Upper Secondary Educational Reforms in Norway, in Heikkinen, A (ed.) Vocational Education and Culture – European Prospects from History and Life-History, Tampereen Yliopisto, Tampere. Sakaiya, T. (1991), The knowledge value revolution, Kodansha International, Tokyo. Vygotsky, LS, (1978), “Mind in Society – The Development of Higher Psychological Processes.” Editors: Michael Cole, Vera John-Steiner, Sylvia Scribner, and Ellen Souberman, Harvard University Press, Massachusetts, USA. This entry was posted on Friday, November 9th, 2007 at 11:56	and is filed under PLEs, Wales Wide Web. You can follow any responses to this entry through the RSS 2.0 feed. Both comments and pings are currently closed.